Coco Chanel has been the fascinating, and sometimes controversial, subject of many, many biographies, several of which I have read. However, none has charmed me quite the way Different Like Coco has. This delightful slim book by Elizabeth Matthews is written for the 5 – 9 group. Now, I don’t mean the fun-loving cocktail ladies, who start sipping at 5:00 PM and finally get to dinner at 9:00. No, this group is the age-group of 5 – 9, meaning the “little” ones. 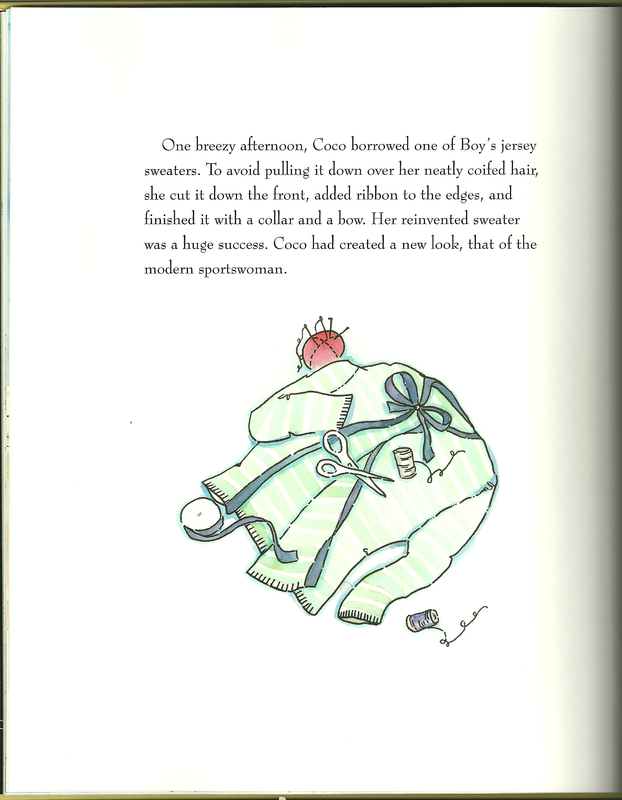 Yes, this is a children’s book, a small biography of Coco Chanel, with expressive illustrations, and text which strikes a good balance between simplicity and sophistication. This bright yellow book jacket hints at the lively story inside. On one level, the book is purely biographical, emphasizing Chanel’s childhood spent in poverty – which she did not allow to define her. The later part of her childhood was spent in a convent, and it was there where she learned to sew. 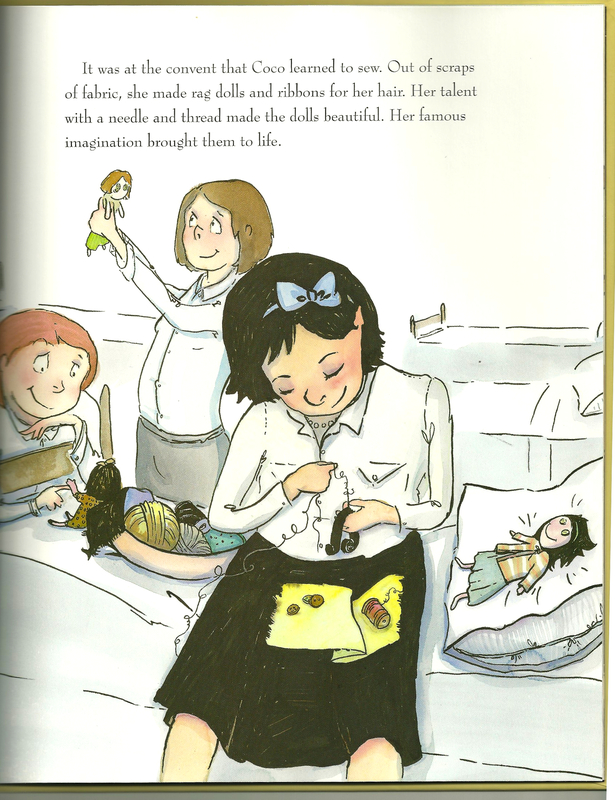 The author’s charming illustration of Coco as a child with her sewing. Those sewing skills were the “mechanical” ticket to her success, while her creativity, her determination, her hard work and her daring flounting of convention set her apart from others of her age. The story emphasizes these characteristics for the young readers of this book, which makes it more than a biography. Indeed, these characteristics are treated as inspirational, which they certainly can be to children. Some of the more controversial aspects of Chanel’s life are handled discreetly, so that the opening of her first shop and the creation of the classic cardigan jacket (made from one of her lover’s sweaters) are seamless chapters in her life story. For the adult reader of this sweet book, there are two features which I guarantee will be read again and again. One is the “Timeline” which is in the back of the book (accompanied by a bibliography, too). All the important dates of Chanel’s life are succinctly listed, including the development of her perfume Chanel No. 5 in 1921; the afore-mentioned creation of her signature jacket, also in 1921, and her debut of the “little black dress” in 1926. 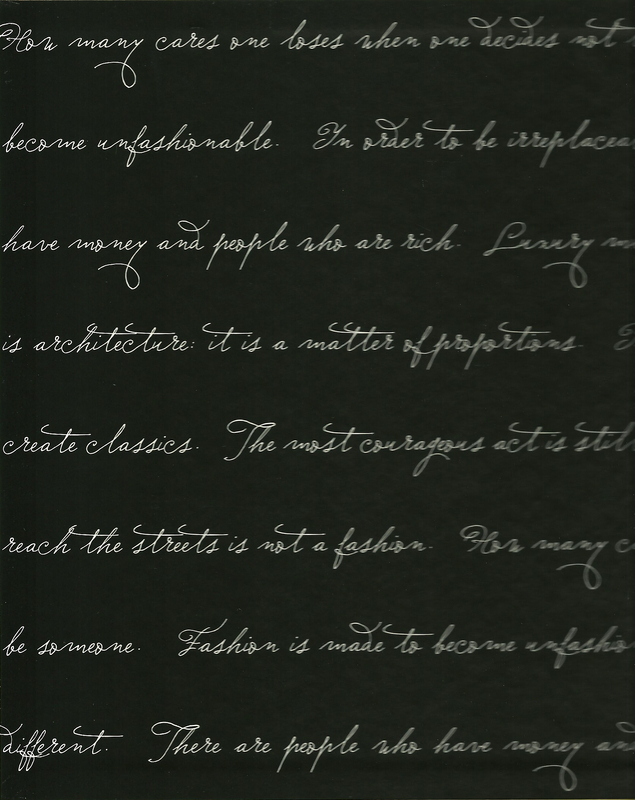 The other compelling aspect of this book is one of pure brilliance from a design point of view: the lining pages feature a “running commentary” of some of Chanel’s famous and less-known quotes. One side of the lining pages of the book. Click on the window for an enlarged view. PLEASE NOTE THAT ALL ILLUSTRATIONS ARE COPYRIGHT 2007, ELIZABETH MATTHEWS. 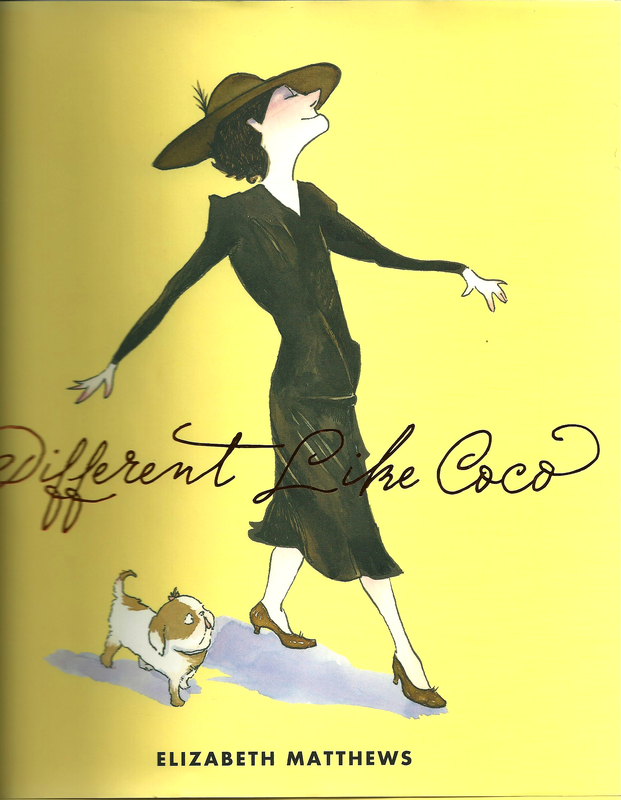 Thank you, Elizabeth Matthews, for making the life story of Coco Chanel an inspiring and almost magical tale for 5 to 9-ers of every age! Thanks so much for the heads-up about this! My eleven year old granddaughter adores all things Chanel! I’m getting this for her! Now tell us about your jacket!! You definitely need this book, Brooke. You can read it to your nieces, if you need an excuse for buying it! This looks like a WONDERFUL book. Off to the bookstore to pick up a copy! What a wonderful post, Karen. I think this book is not just for children! It definitely has multi-generational appeal! Wow what a brilliant idea. 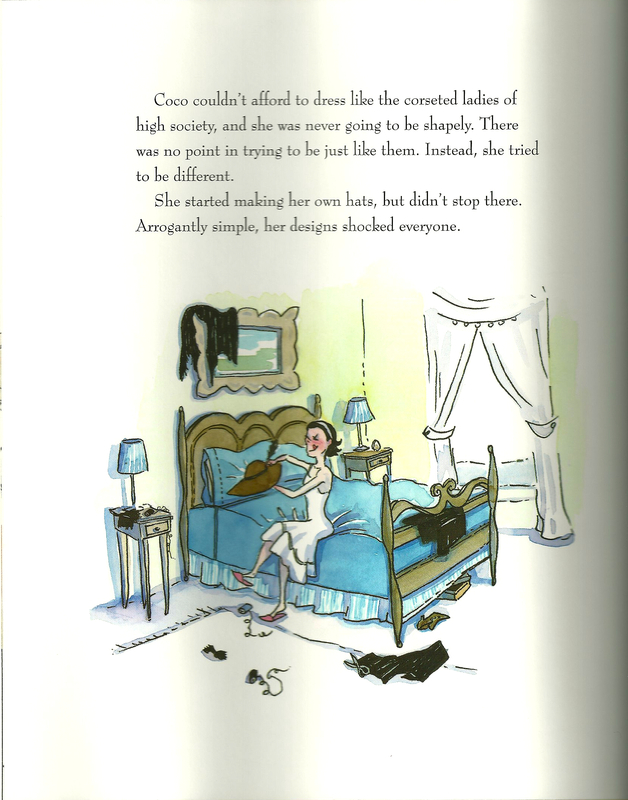 Who’d have thought to make something like the life of Coco Chanel accessible to kiddos. My two will love this so many thanks Karen for finding it and telling us about it.